It is less than five months before 2016 ends and I can honestly feel the pressure. Am I the only one who feel like the year flew by too quickly? Aside from the excitement of the coming -ber months I am also extremely pumped up to get my finances back in order just before 2016 ends. I've put a lot of small and big financial goals that I want to ponder upon. Today I will walk you through some steps you could do in order to sort things out financially. Its time of the year to face the truth about our finances and live the few remaining months savvy. Here are Ways on How to Get Your Finances In Order Before 2016 Ends. Let's be honest, most of us have messy wallets filled with different cards and receipts and crumpled bills gathered for so long. Now a fat and bulging wallet isn't always a sign of wealth. It is often a characteristic of a disorganized human being. Ouch! So why not try to cut down the inside of your wallet only to the essentials? Of course you need your bills and coins inside your wallet for either food and transportation allowance. Always keep smaller bills and coins in case you encounter a store or a service who has no change. Put your loose coins in a piggy bank if you want to save some money at the end of the month. Your IDs from work to government issued should always be inside your wallet. This will come in handy in case something happened to you. There are also buildings and locations that will ask for your ID before entering so you better have one. Now its also important that you take care of your government-issued ID such as your Social Security card because it might be a gateway to identity theft. Some rewards card can offer you discounts and savings in your every purchase. Keep the most used rewards card always in your wallet. READ: Does Customers Rewards Card Really Work? Items you shouldn't carry inside your wallet are definitely receipts that can take up a lot of space inside your wallet. Also refrain from carrying too many cards like extra credit and debit card you won't really use and need. It is also nice not to bring a note with your PIN/Password which I know some often than not do. Another important thing that we often neglect is checking how much we've been paying and contributing to our government based insurance programs. There are cases where employees find out late that their company is/are not paying for their contributions. You need these government based insurance in case of emergencies so its just important that you keep yourself updated at all times. Allow yourself to sit down and review the budget your are using for the past seven months. This will give you an idea on what's working and what's not working for your financial life. You can also identify some ways to tweak your budget so you'll have more money saved rather than impulsively spent. How To Do A Budget Review? Review whether there is a new source of income for you or if ever you've lost a source of income along the way. Maybe you've got a salary increase then you should decide how to allocate. Make sure that you when you do your budget you are only using the net pay or money less taxes and deductions as well as tithes. How much money did you save before 2016 ends? I hope you did save some to look forward next year. If ever you've made some major financial mistakes and got caught on a money trap then don't budge. You still have five months left to work extra hard for your financial life to get in order. Commit on saving a portion of your money every payday. No matter how small or big it would be, save. Once money comes in your payroll reserve a certain amount to your savings account. If it is possible for you to have an extra income before the ends then please do. I have made a post on business ideas you could start immediately and with minimal cost. Remember that no job can secure you forever. It is only through proper savings that you will be spared from getting into debt and other money issues. Knowing your current financial net worth is important because it gives you a reference point to how 2016 would end. Your Net Worth is equal to Total Assets and Total Liabilities. In my post Why You Must Know Your Financial Net Worth Now I've mentioned the following reasons why you should learn to calculate. The importance of knowing your net worth as early as now is to help you in your financial decisions. Once you have an overview of what you own (assets) you can simply examine whether they are giving you any active or passive income. You can deliberate whether to let go of an item or not. You can realize how many funds are being wasted that should have been part of your debt payments. Once your done calculating your personal net worth you can now review your current financial status. You can do this every 3 months or whenever you have a big financial decision to think about. Again your aim is to have a positive net worth, more than positive if possible. 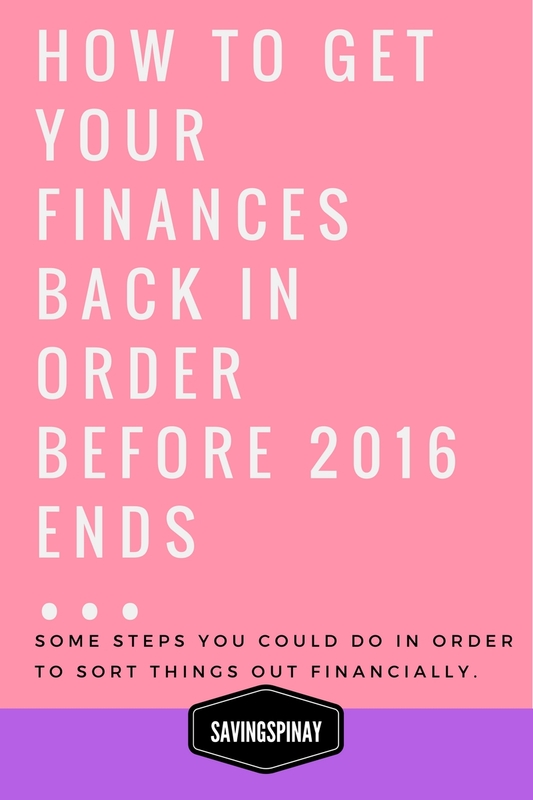 To totally get your finances in order before 2016 ends then you must spend some time reflecting on the past year. Look at your spending habits from the past seven months and identify where your money have gone. Check whether there's a way you could save money on your utility bills. Be honest with yourself and reflect on your financial mistakes and spending habits that refrain you from achieving any progress. I hope the ways above help you get your finances in order before 2016 ends. Let me know if you've applied any of the above. Share your experience and your worries as well. 1 comment on "How to Get Your Finances In Order Before 2016 Ends"
Thanks for sharing valuable post with us. Keep posting like this informative post.